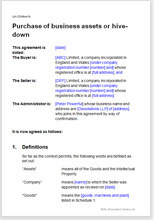 This is an agreement to buy some or all of the assets of a business. They might include fixed assets such as plant and equipment, current assets such as stock, or intangible ones such as customer lists or other intellectual property. The seller gives no warranties to the condition of what is being bought, nor takes any post-sale risk that the buyer might not be satisfied. The document can be used in any circumstance where it is not the business itself that is being sold, but constituents of it, for example, in a break-up of a company in administration, a hive-down or a hive-up.